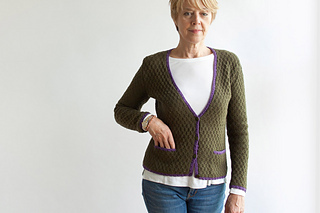 Terasa is a most delightful, long-sleeved, v-neck cardigan. Worked in 2 colors (a main color and trim), its overall stitch pattern is the seeded rib check, a simple alternating knit/purl sequence, that is dense and springy – and super comfortable. 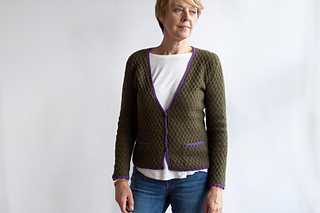 Other features of this elegant cardigan include its 4 button closure and horizontal pockets, positioned at hips and lined with the trim color for some secret fun. Terasa, I feel, is destined to become one of my year-round favorites. No blocking required as this luxe fabric lies flat and stays true to gauge. Pieces are knit flat, bottom-up, with seaming. – CC (trim) Crocus #115; 1 skein all sizes, or for comparable yarn, approximately 115, 120, 125, 130, 140, 145, 150 yards. Techniques: knit, purl, k2tog, k2tog tbl, p2tog, p2tog tbl, stitch pick up around neckline and center front, and seaming. 13 page pdf includes pattern instructions, photographs, schematics, stitch descriptions and charts, relevant abbreviations, shaping notes, and a multi-set stitch pattern template to assist tracking of stitch sequences during shaping.